VICTORIA, BC - Victoria Highlanders FC (5-8-0) host Oregon-side Lane United FC (4-4-5) in Week 11 of the Premier Development League (PDL) regular season, July 14 (2:00 PM PST KO) at UVic’s Centennial Stadium. The Highlanders return to Victoria following their 2-1 comeback win away versus Portland Timbers U-23 midweek. Highlanders aim for third place as they host Lane United FC in their final match of the 2018 season. The match will be streamed online through the Highlander’s Official Youtube Channel. Following a 3-1 loss to Sounders U-23, the Highlanders have made it their goal to end the season in third place. Their final road trip of the year was down to Salem, Oregon on Wednesday, July 11 versus Portland Timbers U-23. The game kicked off early with a quick goal from the home side to make it 1-0 at 8-minutes. Victoria quickly replied with a goal of their own converted by Blair Sturrock to equalize at 9-minutes. The Highlander’s continuous pressure led to a great goal at 37-minutes from the game’s Captain Thomas Shores. The visitor’s second goal was a nicely hit half-volley placed into the bottom right corner of the net to seal all three points. With the three points in Oregon, the Highlanders now have a chance to finish the season strong in third place. Three points in front of the home crowd on Saturday will end what has been a great 2018 campaign for the Highlanders. Lane United travel to Victoria on Saturday with the same goal of finishing third place in the division. Lane are coming off a five game home run ending 2-2-1. The visitors will travel to Centennial Stadium on a wave of momentum following their 2-1 win versus Highlander’s rivals TSS FC Rovers. Despite losing 4-0 last Friday versus the division leaders Calgary Foothills, Lane responded well with a strong performance versus TSS. Lane opened up their game versus TSS with a goal at 30-minutes converted by Charlie Spurr. Holding onto the lead at 68-minutes Lane were able to double their lead with a goal from Andrew Boyd. Despite a late goal from TSS, Lane held onto the three points and look to disrupt Victoria’s final home game with a win north of the border. In the 2018 regular season three game series between Lane United and the Victoria Highlanders, the Canadian side holds the advantage with two wins out of two so far. 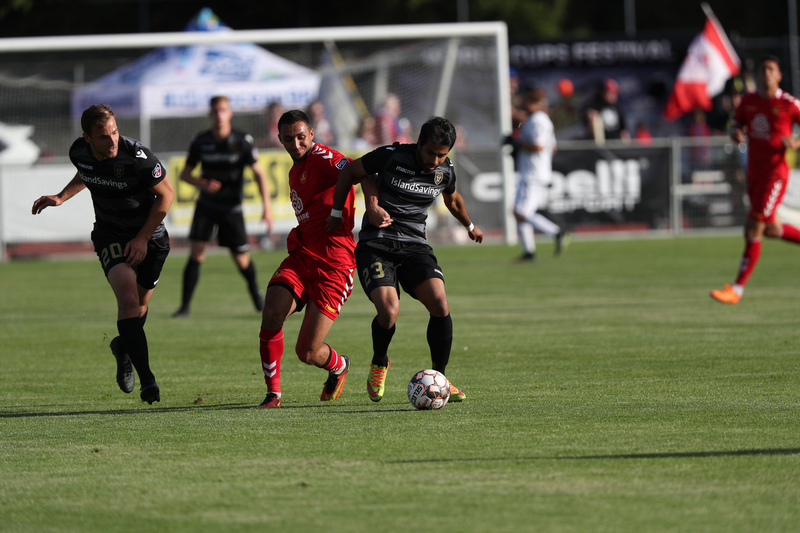 On Friday, May 25 at Centennial Stadium, Lane United traveled to Victoria looking for three points early into the season. Highlanders sent Lane United home empty handed winning 1-0 with a goal from Cory Bent to seal all three points. Victoria traveled to Springfield, Oregon for the second game of the series Friday, June 22 winning 2-1 in another closely contested match. An early goal from Lane’s Nick Moon was equalized by Victoria’s Francesco Bartolillo just before half. At 77-minutes Chris Rushworth tucked away a second goal for the visitors to take all three points back to Victoria. We want to end the season strong, so grab a friend and come out to UVic’s Centennial Stadium to enjoy a great atmosphere! Tickets are available at www.highlandersfc.ca/tickets. For more information, please visit www.highlandersfc.ca. Behind the scenes, the Highlanders organization has undergone a complete overhaul since the 2017 PDL season. A new ownership group, new logo and an unprecedented number of local partners have come together to put the club back on the sporting map. The changes are a positive step for the club, who will be aiming to rise to the top of Victoria’s sporting scene with fresh game-day activations and professional structure. Last season the Highlanders competed in the Premier Development League (PDL). Developing a path for aspiring professional soccer players to reach the highest level. Notable players such as Brett Levis (Whitecaps FC), Jamar Dixon (Ottawa Fury), and Matt Polster (Chicago Fire) are just a few of the notable alumni that have come through Victoria’s ranks.